Is éard a bhí i gceist le Cogadh Fháclainne (nó Cogadh an Atlantaigh Theas mar a deir lucht labhartha na Spáinnise: La Guerra del Atlántico Sur) ná cogadh idir an Ríocht Aontaithe agus an Airgintín faoi Oileáin Fháclainne nó Las Malvinas mar a thugtar orthu as Spáinnis, chomh maith le hOileán Georgia Theas agus le hOileáin Sandwich Theas, ó 2 Aibreán 1982 go dtí 10 Meitheamh 1982. Bhí an Airgintín le fada ag éileamh na n-oileán seo, agus is cuid lárnach de náisiúnachas na hAirgintíne an t-éileamh seo. Ba é ba chúis leis an gcogadh ná seanfhaltanas faoi cé leis na hoileáin seo. Is é tuairim na hAirgintíne ná gur críocha Airgintíneacha iad na hoileáin agus nach raibh na hAirgintíneach ach ag iarraidh tailte dá gcuid féin a fháil ar ais. Maidir leis na Sasanaigh, deir siadsan gur coilíneacht de chuid na Corónach iad na hoileáin ón mbliain 1841 anuas. Go gairid roimh an gcogadh, bhí an deachtóireacht san Airgintín ag streachailt le géarchéim eacnamaíochta, agus muintir na tíre ag agóidíocht in aghaidh an rialtais mhíleata. Thairis sin bhí an rialtas féin cineál idir eatarthu agus an chumhacht ba mhó á haistriú ó Jorge Videla go Roberto Viola. I Mí na Nollag 1981 tháinig junta míleata nua ar an bhfód agus Leopoldo Galtieri i gceannas. Ba é an tAimiréal Jorge Anaya, áfach, ba mhó a bhí ag moladh ionradh Fháclainne, ó bhí sé suite siúráilte nach mbacfadh na Sasanaigh leis na hoileáin. Bhí an rialtas míleata ag cailleadh fóid i measc na cosmhuintire toisc go raibh an eacnamaíocht ag titim as a chéile, agus an dóigh a raibh daoine á ngabháil agus á marú faoi choim ní raibh sé ag tabhú tacaíochta don deachtóireacht ach an oiread. Ar an 19 Márta chuaigh dornán trádálaithe mangarae i dtír ar Oileán Georgia Theas le bratach na hAirgintíne a ardú (le fírinne bhí saighdiúirí Airgintíneacha ina measc), rud a chuir as do rialtas na Ríochta Aontaithe go mór, agus tháinig an soitheach Sasanach HMS Endurance go dtí Georgia Theas mar fhreagra. Sa deireadh, ar an 3 Aibreán, shealbhaigh fórsaí na hAirgintíne Georgia Theas. Bhí na hAirgintínigh díreach tar éis Oileáin Fháclainne a fhorghabháil. Tháinig ionradh na hAirgintíne ar na hoileáin aniar aduaidh ar na Sasanaigh, ach le fírinne bhí rabhadh faighte acu roimhe sin ó Nicholas Barker, a bhí ina Chaptaen sa Chabhlach Ríoga. 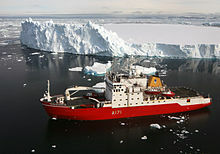 Bhí John Nott, an Rúnaí Cosanta, díreach tar éis tuarascaíl a eisiúint inar mhol sé an HMS Endurance a tharraingt siar ó na hoileáin. Ba í an Endurance an t-aon soitheach a bhí ag an gCabhlach Ríoga in Oileáin Fháclainne, agus ní raibh san Endurance féin ach long bheag oighearbhristeoireachta agus suirbhéireachta. Bhí Barker buartha go n-ionsódh na hAirgintínigh na hoileáin i ndiaidh an tuarascáil a léamh, ó bhí sí ag tabhairt le fios nach raibh an Ríocht Aontaithe fonnmhar na hoileáin a chosaint. Cuireadh an chéad síol le Cogadh Fháclainne, nuair a tháinig mangairí dramh-mhiotail i dtír ar Oileán Georgia Theas ar an 19 Márta 1982. D'ardaigh siad an bhratach Airgintíneach. Go gairid ina dhiaidh sin, ar an 2 Aibreán 1982, d'fhorghabh na hAirgintínigh Oileáin Fháclainne féin. Thosaigh an cogadh ar an 2 Aibreán 1982, nuair a rinne an Airgintín ionradh agus forghabháil ar Oileáin Fháclainne; go gairid ina dhiaidh sin shealbhaigh na hAirgintínigh Oileáin Georgia Theas agus Sandwich Theas chomh maith. Cogadh deich seachtaine a bhí ann. D'ionsaigh cabhlach na Ríochta Aontaithe na hoileáin ar an 5 Aibreán leis an lámh in uachtar a fháil ar chabhlach agus aerfhórsa na hAirgintíne agus an ród a réiteach do na trúpaí talún. San am seo, bhí an Airgintín á rialú le lámh láidir ag rialtas míleata an Ghinearáil Leopoldo Galtieri, agus é buartha faoina chumhacht, ó bhí géarchéim eacnamaíochta ag cothú míshástachta i measc na cosmhuintire. Theastaigh cúis uaidh a d'aontódh an náisiún, agus ba é an seanfhaltanas faoi na hOileáin an t-aon chúis a bhí in aice láimhe dó. Is dócha nár chreid Galtieri agus a chuid ginearál go rachadh na Sasanaigh i dtuilleamaí fórsaí míleata leis na hoileáin a athghabháil. Bhí cuma cineál barrúil ar thús an chogaidh: ar an 19 Márta, chuaigh baicle de thrádálaithe mangarae ón Airgintín i dtír in Oileán Georgia Theas leis an mbratach bhánghorm a ardú ansin. Ina dhiaidh sin, áfach, chuaigh na cúrsaí chun dáiríreachta, nó ar an dara lá de Mhí Aibreáin, shealbhaigh fórsaí armtha na hAirgintíne Oileáin Fháclainne féin. Chuala údaráis na Ríochta Aontaithe an chéad iomrá ar an ionsaí seo tríd an raidió amaitéarach, ach nuair a chuala, ní raibh aon mhoill orthu tascfhórsa armtha a shlógadh le dul chun cogaidh ar na hAirgintínigh. Nuair a bhí na cathanna thart, bhí 258 saighdiúirí Briotanacha agus 649 Airgintíneach tar éis bháis, agus na hOileáin athghafa ag na Sasanaigh. Mar sin féin, tá an Airgintín ag éileamh na nOileán inniu féin. Sa Ríocht Aontaithe, threisigh an cogadh go mór mór le tacaíocht na ndaoine leis an bPríomh-Aire Margaret Thatcher. Ón taobh eile de, nuair a bhí an cluiche caillte ag na hAirgintínigh, spreagadh an chosmhuintir thall ansin chun móragóidíochta agus sluachorraíola in aghaidh an rialtais mhíleata, agus glactar leis go coitianta gurbh í an agóidíocht seo a chuir deireadh le deachtóireacht na nginearál, ionas gur tháinig an daonlathas ar ais san Airgintín. Faoi lár an Aibreáin, bhí bunáit aerchogaidh curtha ar bun ag na Sasanaigh in Oileán Ascension. Chuaigh fórsaí armtha an dá stát chun teagmhála le chéile ón Aibreán ar aghaidh. Ar dtús, shealbhaigh na Briotanaigh Oileán Georgia Theas. Chuaigh an chéad díorma dá gcuid i dtír ar an 21 Aibreán, ach ansin, chuir an drochaimsir isteach orthu tuilleadh trúpaí a thabhairt isteach. Ar an 23 Aibreán, tháinig fomhuireán Airgintíneach i gcóngar don tascfhórsa timpeall Georgia Theas, agus cúpla lá ina dhiaidh sin, fuair na Sasanaigh radharc ceart uirthi le hí a ionsaí. Buamáladh í le lánáin doimhneachta is le toirpéid ó na héileacaptair, agus rinneadh an oiread dochair di nach raibh sí ábalta dul faoi uisce a thuilleadh. Thréig an criú an fomhuireán ar an trá i Georgia Theas. Ar an lá céanna, chuaigh na saighdiúirí Sasanacha i dtír ansin, agus ghéill na hAirgintínigh dóibh gan oiread is urchar amháin a scaoileadh. Ina dhiaidh sin, chuaigh eitleáin throma na Ríochta Aontaithe ag buamáil an aerfoirt i bhFáclainn, ach níor éirigh leo mórán dochair a dhéanamh dó: ní raibh na hAirgintínigh i bhfad ag cur deise ar na radair agus ar an rúidbhealach i ndiaidh an bheagáin díobhála a rinne na pléascáin. Go bunúsach, ní raibh na Sasanaigh ach ag cur breosla eitilte amú le linn na n-ionsaithe seo. B'éigean do na heitleáin an-turas a chur díobh ón mbunáit mhíleata in Oileán Ascension go dtí Fáclainn, ionas go gcaithfí breosla a thabhairt dóibh thuas san aer. Ar an chéad lá de Mhí Bealtaine, thosaigh an troid idir na Briotanaigh agus na hAirgintínigh san aer. Bhí na Briotanaigh ábalta trí eitleán de chuid an namhad a bhaint anuas; thairis sin, thit an ceathrú ceann acu le lámhach na nAirgintíneach féin nuair a bhí sí ag iarraidh filleadh go dtí aerfort Stanley le teacht slán ó na Sasanaigh. 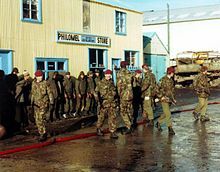 Ar an 2 Bealtaine, shuncáil fomhuireán Sasanach an cúrsóir éadrom Airgintíneach General Belgrano le toirpéid. Maraíodh breis is trí chéad de chriú na loinge, agus b'éigean leis an seacht gcéad eile acu fanacht le lucht a dtarrthála i bhfarraige fhuar stoirmeach. Sa deireadh, tháinig longa Airgintíneacha agus Síleacha chun fortachta dóibh. Bhí suncáil an General Belgrano ina cúis achrainn ina dhiaidh sin i saol polaitiúil na Ríochta Aontaithe, ó bhí an long taobh amuigh den limistéar cogaidh timpeall na n-oileán, nuair a hionsaíodh í. An ARA General Belgrano ar an 2-4 Bealtaine. Maraíodh 323 ar bord. I ndiaidh shuncáil an Belgrano, bhí misneach an chabhlaigh Airgintínigh briste ar fad. D'fhill siad abhaile, agus níor fhág siad an cuan a thuilleadh. Bhí na heitleáin Airgintíneacha ábalta sásamh éigin a bhaint, nó ar an dara lá de Mhí Bealtaine, d'ionsaigh siad an HMS Sheffield, scriostóir Sasanach. Buaileadh an Sheffield le diúracáin de chuid na n-eitleáin, agus chuaigh sí trí thine. Ar an 21 Bealtaine, chuaigh ceithre mhíle de shaighdiúirí Sasanacha i dtír ar na cladaí timpeall San Carlos Water in iarthuaisceart Fháclainn Thoir. Bhí an áit faoi shíorionsaí ag na heitleáin Airgintíneacha, agus bhaist na saighdiúirí Sasanacha Bomb Alley nó Cosán na mBuamaí ar an oibríocht seo. Mar sin féin, d'éirigh leo ceann droichid a bhunú sna hoileáin féin a chuir ar a gcumas na hAirgintínigh a ionsaí agus na hoileáin a athghabháil. Ón taobh eile de, d'éirigh leis na hAirgintínigh an-damáiste a dhéanamh do chabhlach na Breataine Móire faoin am céanna. Shuncáil siad cúpla long Shasanach, ina measc long mhór tráchta a bhí ag tabhairt isteach héileacaptair. Cailliúint mhór a bhí ann ó thaobh na loighistice de. Ar an 27 Bealtaine agus an lá dar gcionn, chuaigh na paratrúipéirí Briotanacha ar aghaidh ó cheann droichid San Carlos le Darwin agus Goose Green a ionsaí. D'éirigh ina chogadh dearg i nGoose Green, agus i ndiaidh cathanna fuilteacha, bhí na hAirgintínigh cloíte. Fuair 55 daoine acu bás sa teagmháil, agus ghéill breis is míle Airgintíneach iad féin do na Briotanaigh. Nuair a bhí na fórsaí Airgintíneacha i nGoose Green curtha i leataobh, thosaigh na trúpaí Briotanacha ag máirseáil trasna leath thuaidh Fháclainn Thoir, i dtreo Teal Inlet ar an gcósta thuaidh. Faoin am céanna, chuaigh fórsaí speisialta na Ríochta Aontaithe i dtír i gcóngar do Stanley. Bhí na hAirgintínigh meáite, áfach, na Sasanaigh a stopadh ag Mount Kent, in aice le Stanley, agus mar sin, bhí comhchruinneagán mór de dhíormaí Airgintíneacha ag fanacht leo ansin. Ar an 1 Meitheamh, tháinig cúig mhíle de shaighdiúirí Briotanacha isteach, sa bhreis ar a raibh ann cheana. Anois, mhothaigh na Sasanaigh iad féin sách láidir le Stanley a ghabháil. Ar an 2 Meitheamh, chuaigh dornán paratrúipéirí go dtí Swan Inlet. Fuair siad amach go raibh an limistéar saor ó thrúpaí Airgintíneacha ar fad, agus mar sin, d'éirigh na Sasanaigh ródhána: d'fhéach siad le dul i dtír timpeall Port Pleasant ar mórscála, ach ansin, d'iompaigh sé amach go raibh siad in áit nach raibh inchosanta. Mar sin, bhí aerfhórsa na hAirgintíne ábalta an-dochar a dhéanamh agus cuid mhór saighdiúirí a mharú. Ar an 11 Meitheamh, thosaigh mórionradh na mBriotanach ar Stanley. Faoi choim na hoíche, d'ionsaigh briogáid iomlán de shaighdiúirí an fáinne de thalamh ard timpeall na príomhchathrach, agus sluaite móra Airgintíneacha á cosaint. I ndiaidh troideanna troma, cloíodh na hAirgintínigh ar an 14 Meitheamh, agus cimíodh 9,800 saighdiúir Airgintíneach. Ina dhiaidh sin, bhí an cogadh beagnach thart. Ghéill na hiarsmaí deireanacha de na hAirgintínigh iad féin in Oileáin Sandwich Theas, timpeall Oileán Georgia Theas. Le fírinne, bhí na trúpaí Airgintíneacha anseo ón mbliain 1976 ar aghaidh, nó sa bhliain sin, bhunaigh an Airgintín Bunáit Mhíleata Corbeta Uruguay in Oileáin Sandwich Theas le brú a chur ar na Sasanaigh ceart na hAirgintíne ar Oileáin Fháclainne a admháil. Ba chuma leis na Sasanaigh an bhunáit seo go dtí gur phléasc an cogadh amach. Ar an 14 Meitheamh tháinig deireadh leis an gcogadh, nuair a ghéill na saighdiúirí deireanacha Airgintíneacha. Fuair 649 saighdiúirí Airgintíneacha, 255 saighdiúirí Sasanacha, agus triúr de bhunadh na n-oileán, bás sa teagmháil. I ndiaidh an chogaidh, chuir fórsaí armtha na Breataine Móire longfort nua míleata ar bun sna hoileáin le súil a choinneáil ar na hAirgintínigh. Cuireadh tarmac nua ar na bóithre agus caoi ní b'fhearr ar na hoileáin ar fad. Tháinig méadú ar dhaonra Stanley, ach tá an tuath á bánú. Sa bhliain 1985, reachtaíodh dlí nua le rialtas dúchais iomlán a chinntiú do na hoileáin. Tá muintir Fháclainne á rialú féin inniu agus daonlathas ionadaíoch acu, cé go bhfuil cúrsaí an pholasaí eachtraigh agus na cosanta fágtha faoi rialtas na Ríochta Aontaithe i gcónaí. Cé go bhfuil na caoirigh tábhachtach do gheilleagar na nOileán i gcónaí, tá athrú ag teacht air sin. Thángthas ar artola, ar dhiamaint agus ar ghás timpeall na nOileán. Thairis sin, tá an turasóireacht ag dul chun tábhachta. Scéal eile fós go mbíonn na hOileáin ag díol cearta iascaireachta le comhlachtaí coimhthíocha iascaigh. Maidir le muintir na n-oileán féin, is de shliocht na Sasanach iad den chuid is mó agus is é an Sacs-Bhéarla a labhraíonn siad. Mar sin, is leis an Ríocht Aontaithe atá a luiteamas. Ag an am céanna, níor éirigh an Airgintín riamh as an éileamh. Nuair a bhí an cogadh á chur, bhí deachtóireacht mhíleata ag rialú na hAirgintíne, agus an Ginearál Leopoldo Galtieri i gceannas ar an rialtas míleata. Nuair a chaill sé an cogadh, áfach, chaill sé tacaíocht na nginearál eile chomh maith. Baineadh an chumhacht de go gairid i ndiaidh an chogaidh, agus thosaigh na fórsaí armtha ag ullmhú athbhunú an daonlathais sa tír. Tugadh an leathanach seo cothrom le dáta an 21 Bealtaine 2018 ag 14:28.